Ann Hutchinson was born in England in 1591 and emigrated to the Massachusetts Bay Colony in 1634 inspired by the well-known and influential Puritan leader John Cotton. 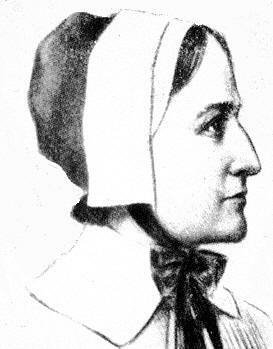 She proved to be an outspoken woman with views that severely challenged the male-dominated Puritan community. She was accused of being an antinomian – an individual that rejects the prevalent Christian notion that strict obedience to the code of religious law(s) is a necessary prerequisite for personal salvation. For her persistent and unflinching expression of her controversial views, she was ultimately banished by the General Court of Massachusetts and excommunicated from the Church of Boston. Although it was rare for a woman of her era to be so outspoken, the schism that had occurred in the Puritan movement during the seventeenth century, made it possible for women to participate more fully as lay preachers and take on more activist roles in church leadership. As was typical for that era, no documents written by Hutchinson remain; however, the court records from her two trials before the General Court (Nov. 1637 and March 1638, respectively) reveal a great deal about the nature of the political, theological and gender-based issues that consumed the Puritan community at that time. Hutchinson was born in Alford, Lincolnshire, England and had 11 siblings. Her father, Francis Marbury, was an Anglican clergyman. On account of her father’s diligence, she was well educated and was well-versed in theology and was taught to openly express her views. She eventually married and gave birth to twelve children and had her last child in Boston. Between the years 1636 and 1638, Hutchinson adamantly expressed her antinomian viewpoint during devotional religious meetings finding fault with the teaching of the conventional Puritan ministry of the time as described above. Following her excommunication from the Church of Boston, the family moved to Aquidneck in Narragansett Bay. The husband died in 1642 and she moved with her six youngest children to New York where the mother and five of those children were killed in an Indian raid in 1643. Ann Hutchinson was certainly a woman unafraid to speak her mind and was an activist at a time when women were expected to know their limited place in society.